Making a House a Home: What's a Bagel Dog??? Some of y'all have got to be sitting there asking, "What in the WORLD is a Bagel Dog?" It's a combination of a hot dog and all the super yummy flavors of an "everything" bagel. So sooooo good!!! This recipe actually came from a low carb website!! (I adjusted the recipe for my family and this recipe reflects my changes.) If you've been reading here for any time, you may remember me saying that I have been trying (emphasis on trying!!!) to watch carbs. Kind of hard when I love to bake!!!!! But my family doesn't really care to limit the dear carbs. This recipe makes ALL of us happy!!! My children love hot dogs and this dough wrapped around it is so very tasty (and Mr. U even likes it!!!!). And the "everything" bagel flavoring on top is AWESOME!!! Whether you are low carb or not, this recipe is definitely one worth trying out!!! Preheat oven to 400 degrees. Line a sheet pan with parchment paper. Place mozzarella & cream cheese in a medium sized microwaveable bowl and microwave for about 1 minute. Stir. Then microwave another 30 seconds. Stir. If it needs another 30 seconds, do so. Stir to combine everything. Make sure all the cheese is melted and the two cheese are mixed together very well. In a separate bowl, add almond flour, 2 eggs and xanthan gum. Mix until combined. Add the melted cheese mixture to the almond mixture and work them into each other. Using a rubber spatula works well, or wet your hands and knead it in the bowl. Mix until you it is all well combined and it all looks the same color. Section dough into 8 balls and with wet or oiled hands, gently roll each one out about 10 inches long. Wrap one piece of dough around each hot dog. (Clearly, looking at my photo, I am not concerned with perfectly wrapped hot dogs). Beat remaining 1 egg in a small bowl to make your egg wash and brush onto each dog. Mix all of the “Everything” Bagel Blend into a bowl and sprinkle the mixture over each rolled up hot dog. Place on lined sheet pan and bake for about 20 minutes at 400 degrees, the dough should be lightly golden. If you don't want to make the dough like this, feel free to use refrigerated biscuit dough! Just roll the dough into ropes and wrap them around the hot dogs. Then brush with a beaten egg wash and sprinkle the "Everything" Bagel Blend right on top. Still SUPER delicious!! This recipe is a nice change to regular hot dogs. I left a link on your FB page. Thank you so much! I have never had a bagel and dog together. This looks and sounds so good. Thank you for the recipe and the idea to make these together! 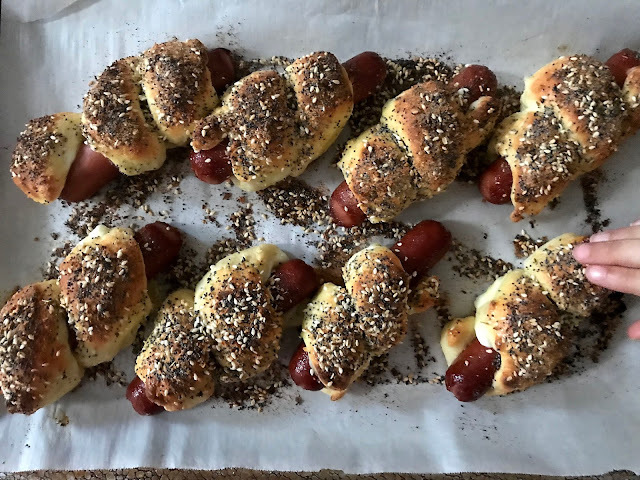 This is like the yummy, grown-up version of pigs in a blanket. So fun! Thanks so much for sharing at the #happynowlinkup! What a special treat, we will love your Bagel Dog! Hope you have a fantastic week and thanks so much for sharing with Full Plate Thursday.